Do you have endless leaves you can’t seem to get on top of? Do you feel like you spend every spare minute in your yard with a rake and yard bags? Do you think you’re finally making progress on the whole mess, only to step outside the following morning and realize you’ve barely made a dent? It doesn’t have to be this way, though. The right tool for the job can make yard cleanup a breeze this autumn. There’s no doubt about it—your leaf rake is going to make or break your weekend chore list during the fall. No other chore during the autumn is so physically demanding for such an extended period of time. Leaves can start dropping as early as September, and cleanup will continue right up until the snow blankets the ground. Don’t let this be another year where you dread your weekends. Free up your time and enjoy your fall clean up. The best way to do this? Bring home a leaf rake that pulls its weight. You’ll find the right leaf rake will make a world of difference in how quickly you’re able to tackle your yard—and how you feel about doing it. Whether you have a large space to maintain or are working with something smaller, you need a rake to get you through the autumn. We’ll review here some of the qualities you should look for in your next rake. Afterward, we’ll share with you our top five personal favorites. Tines are critical to the performance of your leaf rake. If you compromise here, you’ll be hating every minute you spend with your rake. Flimsy, metal tines will just bend when you go to use them, leaving leaves behind. Cheap, plastic tines will snap and leave you with a useless piece of yard equipment. Whatever kind of leaf rake you go with, your tine quality needs to be high. What type of tines you choose will depend on a few different factors. Plastic tines are strong. They are a great choice for dealing with wet and heavy leaves. They can lack flexibility, though. If you are in an area where most of your late autumn will be cool and damp, a leaf rake with plastic tines will suit you well. If you know your rake is going to be tackling rocky or difficult terrain, a plastic rake might be the route for you to take. Metal tines offer the flexibility plastic tines don’t, but won’t handle wet leaves nearly as well. If you are in a crisp and dry autumn climate, this kind of leaf rake is the perfect addition to your arsenal of fall clean-up tools. But if you have yard space with rocks or exposed roots, metal tines can be disfigured faster than plastic tines. While less common than metal or plastic tines, you may also be interested in a leaf rake with bamboo tines. These tines are quite soft and work well on moss and other similar vegetation. As you would expect, however, bamboo tines can be easily damaged when used on rougher terrain. Just as important to a leaf rake’s functionality is the handle. This has more to do with your comfort using the tool than the actual capability of the rake. After all, it won’t matter how great the head of the rake is if you can’t stand to use it for more than ten minutes at a time. Handles come in a variety of materials, including wood, aluminum, and fiberglass. You’ll want something lightweight and easy to work with. In general, a longer handle will be gentler on your back during lengthy raking sessions. The diameter of the handle may vary as well. If it’s too small or too large, you may experience discomfort or cramping while using the rake. Some of this will depend on what kind of landscape you’re working with, but most will come down to personal preference. Try to find a rake handle that comes with a grip, to help prevent hand fatigue. This makes raking more comfortable. Of course, a great pair of work gloves will do you a world of good, as well. The size of the rake head you need will mostly depend on the space you’re using it in. Rakes are widely available in 18 to 24 inches, but may be found in even larger sizes. Narrow rakes are great for uneven terrain, edgework, and other small, complicated spaces. Wide rakes, on the other hand, are great for large, open spaces, where the extra width makes your cleanup fast and easy. Many rake models offer adjustable heads. This can be a great way to increase the versatility of your tool. Instead of having both a narrow-headed rake and a wide-headed one, a single tool can be adjusted to the size you need. You will find that the shape of rake heads varies as well. Some will be long, narrow, fans. Others may be wider and shorter. One shape is not inherently more efficient than the others. Although you might find they suit specific tasks better. Long, v-shaped heads will be great for raking up dry, lightweight leaves. Squatter heads will be better for pulling up sodden, heavy leaves. Knowing what you plan to use your rake on will help you choose the best tool possible for your fall cleanup. Keeping all of these features in mind, here are our favorite rakes on the market. Take a look at these reviewed rakes and choose the one that best suits you and your yard. The ML Tools leaf rake offers endless customization options. If you are looking for a rake that can fulfill a variety of needs and roles, this is a great one to add to your lineup. This is a fully adjustable rake. The head of the rake can be as narrow as 7.5 inches or as wide as 24 inches. The length of the rake handle adjusts from 31 inches all the way up to 64 inches. If you have a large variety of yard spaces or multiple users, this is just the kind of tool you want to include in your garden shed. The head of the rake has 15 flat aluminum tines. It is lightweight and the metal handle comes equipped with plastic hand grips in two locations, to increase your comfort. At its smallest size, this rake takes up very little space. If storage is at a premium, this model can be a lifesaver. Weighing in at only 2 pounds, it is versatile and won’t wear you out. Available at an affordable price point, it also comes with a satisfaction guarantee. You have absolutely nothing to lose by giving it a try. While there are many good things to say about ML Tools leaf rake, there are a few things you should be aware of before purchasing. The first is that the lock mechanism could be improved upon—the tines may shift during use. This can lead to some frustration, but the flexibility in use options more than make up for it. It’s also worth noting that the handle is on the narrow side. You may encounter some cramping and hand discomfort when using this piece of equipment if you have larger hands. With its adjustable head, this rake is perfect for narrow, tricky spots, as well as wide, unencumbered spaces. The adjustable handle length means this is a great rake for people of all heights and for use in a variety of spaces. Collapsed to its smallest form, this rake takes up minimal storage space. The rake handle is thin and not comfortable for prolonged use. The lock mechanism isn’t as good as it should be, and sometimes the tines will shift during use. 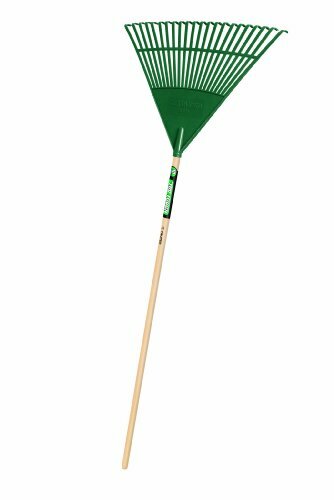 This plastic leaf rake is heavy duty and easy to care for. Its 22-inch rake head makes leaf cleanup quick and easy. You can just spray down the rake head after use, for a fast, efficient clean. Like all other Tru Tough tools, this product comes with a ten-year replacement guarantee. Should something happen to your rake during that time, Tru Tough will replace your rake at no cost to you. The unit weighs in at 1.5 pounds, making it very lightweight. It’s great for long sessions of yard work. The lacquered wood handle is 48 inches long. The tips of the tines aren’t overly long, making it a great choice for raking under and between low bushes, trees, and shrubs. However, the shape of the rake head and the length of the tines’ tips mean this isn’t a great choice for raking large quantities of leaves in the yard. If the leaf pile gets thick or heavy, you might start to experience increasing difficulty, as I did. If you are expecting a wet fall, or know your leaves are numerous, a different rake will serve you better. This rake is not collapsible and can be a little tricky to store. To stand on its own, it needs to be propped at a significant angle. This takes up valuable floor and walking space. Sadly, it doesn’t have a hole at the top of the handle so hanging it on a nail isn’t a quick option. However, a shed tool organizer mounted on the wall can be a simple solution to this problem. The plastic head is low maintenance and easy to clean. It has a 10-year replacement guarantee. The head and handle are both made of durable materials. This rake is perfect for cleaning leaves and debris out from under low-sitting landscape plants. The shorter tips on the tines make this rake less suitable for large scale cleanups and better for maintenance use. The rake’s handle doesn’t offer a hole or hanging strip for easy storage—an external storage apparatus of some kind is required for storing. This is not your average rake. The solid top half of this rake head and its low and wide shape set it apart. 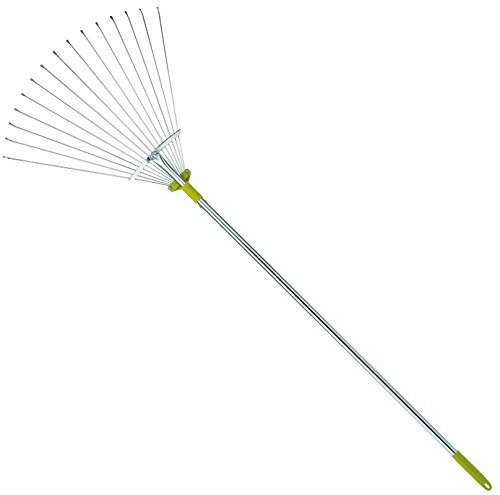 It is this unique shape that makes the Fiskars leaf rake ideal for quickly dealing with large quantities of leaves. The closely-set tines help prevent any leaves from getting trapped and work to scoop them toward their final destination. A single, effective pass will leave the space leaf-free. The heavy-duty plastic that the rake head is constructed from makes it efficient for grabbing heavy, wet, leaves. The tines of this rake are curved at the end instead of boasting a strong angle. The curve means they have more give and reduces the likelihood of breakage. If you know you’ll be using your rake over rough terrain, this rake can stand up to the challenge. The rake head is plastic and 24 inches wide. The handle is made from aluminum. The whole unit is 67 inches long and suitable for users of all heights. The extra-long, ergonomically designed handle helps reduce back fatigue. This rake is great for frequent or extended periods of use. You may find that you don’t really need this feature because the rake’s exceptional design makes quick work of even the largest jobs. This product comes with the Fiskars’ lifetime guarantee, so you know you’re getting a product they expect to last. Should this product fail at any time, just contact Fiskars for a replacement. Whether you’re a professional landscaper or just a homeowner looking to have a tidy lawn, this rake is an invaluable tool for your arsenal. Uniquely designed to be as effective as possible—even with small or wet and heavy leaves. Ergonomically designed, so that even those with back concerns can use this rake comfortably. The rake head is attached to the handle with a screw that can be problematic. Be aware that the screw may come loose and could easily be lost during use. Made from high-grade materials, this adjustable rake is meant to last through years of use. The handle’s rubber, ergonomic grip helps protect you from hand fatigue and makes your yard work more enjoyable. The release and lock mechanism is easy to use—there’s no struggling to adjust the size of this rake. When the handle is fully collapsed, the unit is only 32 inches long. Fully extended, it reaches a length of 62 inches. Just as adjustable is the head of the rake. You can have a width of only 7.5 inches. This width is great for narrow, hard-to-reach spaces. It’s also useful when gardening around flower beds, koi ponds, or rocks. If you need more ground coverage, the head of the rake can be as wide as 19.5 inches. This is a great width for more substantial yard work on an open lawn. Both the rake head and the handle are made from aluminum alloy. You’ll get plenty of use out of your rake without worrying about deterioration, disfigurement, or rust. This is a high-quality, versatile rake that won’t disappoint you. This rake is sturdy enough to take on large-scale cleanups, but also gentle and easy to use in more delicate areas, like flower beds. The tines themselves are narrow, which means small leaves may escape the rake. If you’re raking leaves, collapse the head to a narrow width for the best results. This does mean that your cleaning area will be less, though. In its collapsed form, this is another space-saving product that works well for people with limited storage. Collapsible and space-saving rake is ideal for small spaces and limited storage. Fully adjustable and versatile product for all your yard needs. Made from high-grade materials and intended to last season after season. The lock and release mechanism responsible for customizing length and width is easy to use. This is not a lightweight rake—the high-quality metal and lock mechanism add weight to the rake, which may leave users sore after prolonged use. The narrow tines make it difficult to grab leaves, unless you’re working with the narrow head. This reduces the area you can expect to clean in a single pass. 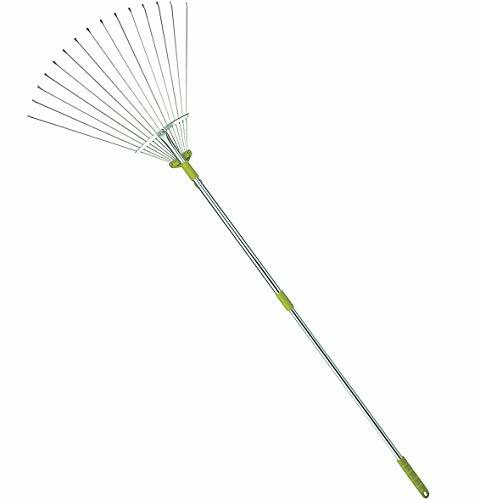 This Equinox International garden leaf rake is a great addition to your yard tools. The adjustable head sports 15 tines and can be as narrow as 7 inches or as wide as 22 inches. This rake is 63 inches long. The extra length of the handle works to reduce back fatigue and makes for a more comfortable cleanup experience. It is versatile and ready to tackle any yard needs you have. 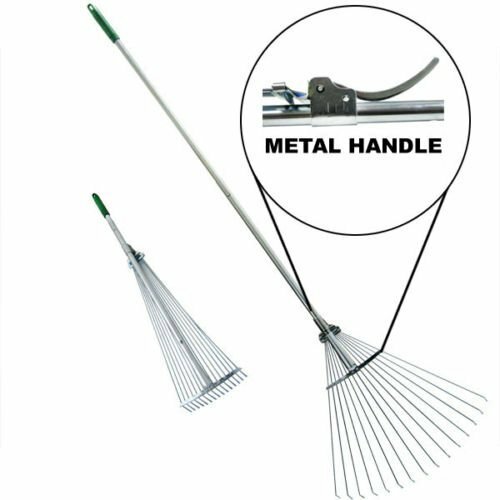 Both the head and the handle of this rake are constructed of zinc-plated steel and will resist rusting. Whether you live in a warm autumn climate or one that’s characterized by drizzly, damp days, this rake can accommodate you. This is definitely a great adjustable leaf rake. If you have piles of dry, crisp leaves, this rake will make short work of your chore. However, you’ll want to protect this unit from some of your rougher rake needs. If you’re looking for something to use in rocky beds or landscaping, a heavy-duty plastic head will serve you better. One of the best things about a collapsible rake is that it takes minimal space to store. This one is no exception. While the head of the rake can be collapsed to take up less space, the handle is not adjustable and remains a single length. Keep this in mind for your storing needs. This rake is lightweight, at just over 2 pounds, and comes with a 100 percent satisfaction guarantee. If it isn’t everything you hoped it would be, simply return it to Equinox International. A great value rake for the quality of the product. The metal handle is comfortable, even for long periods of use. The collapsible and adjustable head is great for customizing to your needs. Flat tines are perfect for collecting leaves, fluffing ground covers, and maintaining garden beds and lawns. This piece is rust-proof and lightweight. You receive a 100 percent satisfaction guarantee with the purchase of this rake. The rake’s handle is not adjustable in length so you’ll need a receptacle or shed with a significant height for storing. While great for leaves, this is strictly a leaf-rake and won’t stand up to more arduous gardening tasks. When you’re looking for the perfect tool for your yard work, there are a lot of points and features to consider. All of these rakes would make a great addition to your collection of yard equipment. But we do have a favorite we would like to recommend over the others. For the high quality versatility of the product, and its affordable price point, we just can’t get enough of the Equinox International 63-inch adjustable garden leaf rake. It’s good at what it does and there’s no reason to have it missing from your fall cleanup toolkit. This rake has everything you need in a leaf rake. Its adjustable head allows for easy use, even in tight spaces. It’s perfect for raking out under bushes and low-set trees. But it is just as well suited to being used on the lawn for large-scale leaf cleanups. With its rust-resistant coating and ergonomic design, you’ll be happy to use this rake again and again. And its construction will stand the test of time. If you can have only one leaf rake, let it be this one. You won’t be disappointed with its performance.